This is the perfect surprise for a cheese lover! 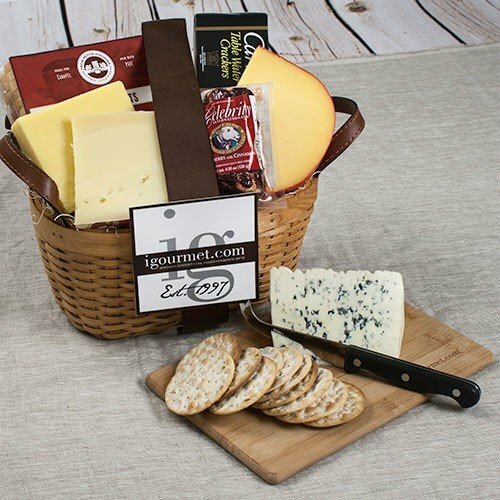 We put together a gift basket with an awesome selection of cheeses and crackers. igourmet.com Logo Cutting Board: The inclusion of this cutting board makes it easy to enjoy all of these cheeses the moment the box is opened. Gift Presentation: Hand assembled in a woven wood vessel, finished with an elegant brown ribbon. Please note that any item temporarily out of stock will be substituted with a similar item of equal value. Free shipping offer only applies to street addresses in the contiguous 48 states. This premium gift includes only the finest gourmet treats. A luxurious collection of international specialties. An ideal way to impress someone who may be hard-to-please. Beautifully hand-packed and guaranteed to arrive in perfect condition. FREE SHIPPING valid to continental US street addresses only.